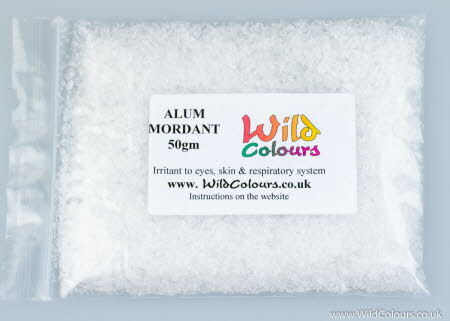 Potassium Alum 50 gram pack for mordanting wool, cotton, silk & paper. Potassium alum or potash alum is potassium aluminium sulphate dodecahydrate and our potassium alum is 99% pure and heavy metal free. Potassium Alum Mordant is weighed and sealed in a polythene bag. The bag is then labelled, placed in a padded envelope and posted to you First Class.